WHMIS 2015 Training Online - Online Course at YOW Canada Inc.
WHMIS Video Training also Available! YOW is now offering Course Customization! 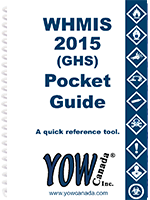 Now available: WHMIS 2015 (GHS) training! On December 1st, YOW Canada launched a newly updated WHMIS training program which is streamlined to cover only WHMIS 2015 content as the final transition to GHS deadline was reached. The online course content, and all related training materials were updated to comply with Canada's transition to GHS training requirements. 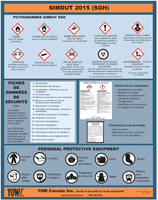 Despite its name, WHMIS 2015 is the most current standard in Canada. WHMIS certificates issued by YOW Canada prior to May 1st, 2015 are no longer valid. 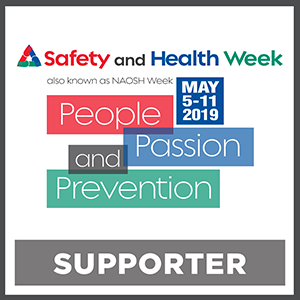 Everyone who works with or may come into contact with hazardous materials at work. This may include maintenance and janitorial staff, office personnel, teachers, co-op students, shop/science students, auto mechanics, restaurant workers, health clinic and lab staff, nurses, doctors and more. 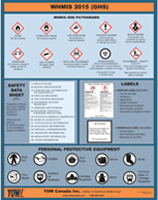 Some common examples of workplace hazardous products include certain cleaning products, degreasers, fire extinguishers, lubricants, chlorine, gasoline and propane. Since many workers in Canada use or are exposed to hazardous products every day at work, this online training program was designed to meet Canada-wide requirements for general WHMIS 2015 training and is not industry specific. Training certificates are issued upon successful completion and emailed to the Training Administrator. If you have questions regarding the WHMIS 2015 (GHS) regulations, training or specific products, please contact us: 1.866.688.2845 or info@yowcanada.com.